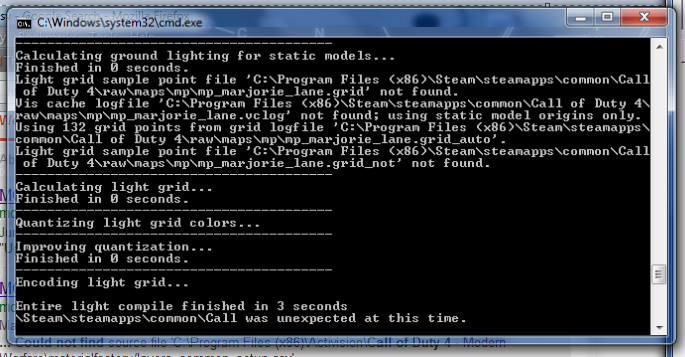 MODSonline - Forums, Never run into this error before with COD4 Mod Tools. Author Topic: Never run into this error before with COD4 Mod Tools. I have done a decent amount of mapping before this map I am currently making, and even made my own zombie map on COD5. My computer has had to go through a full system restore some time ago and I am now just getting back to mapping on COD. I just made an account here on modsonline because I looked everywhere for this error. I found 2 threads around the Internet about it, but no solutions were posted. 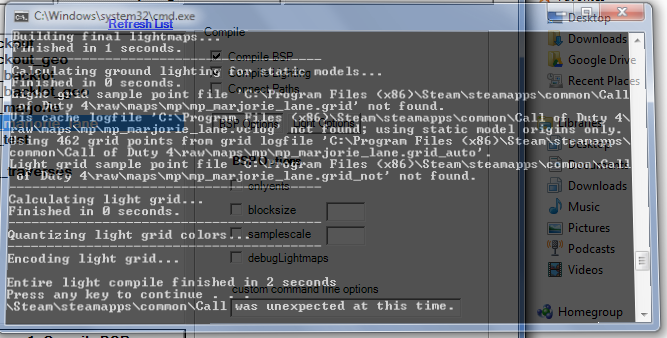 So what happens is when I go to "Compile BSP" for my map in the COD4 Mod Tools, it closes unexpectedly and since it closes so quickly, I had to take a snapshot of what it was saying at the right time, and it says on the last line of the cmd, "\Steam\steamapps\common\Call was unexpected at this time." 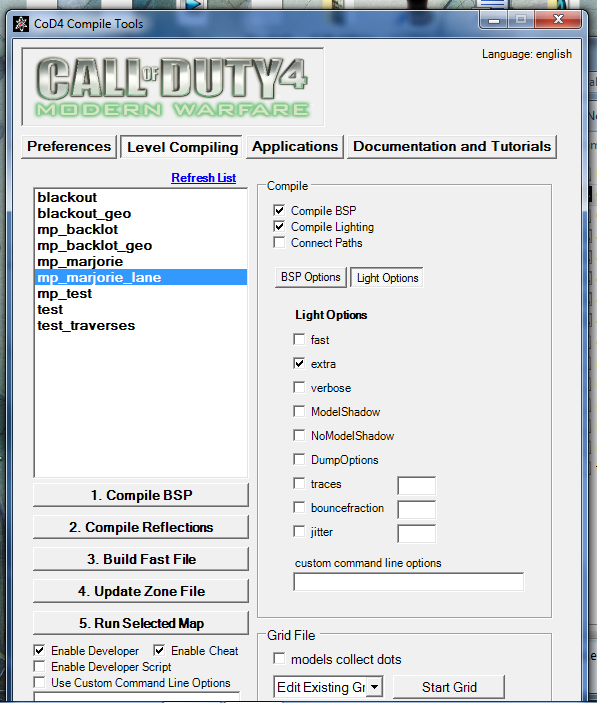 I really need this all to be working as I need to make a map for COD4 for a project for school. So I'm trying to test my map as soon as possible. Picture will be attached for the error I get. 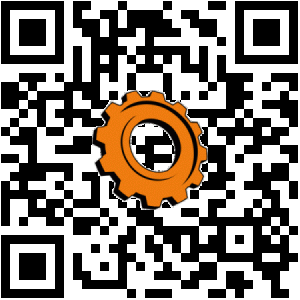 EDIT: This error also occurs when I compile any other map such as mp_test! Post a screenshot of your compile options so that we can see what boxes (options) you have selected. Make sure the "connect paths" is not selected unless your map is a single player one. Maybe your're also having access is denied error as in this post? I did what that article said, and I got the same issue. The pauses occur twice, and on the third time, it crashes again due to the same thing. I need this to be fixed somehow soon. What I'm making is going to be for a school project and I'm screwed if it's not going to work! Try plugging in your headphones. Multiplayer won't work without it. Sometimes the dumbest and most simple things fix the most complicated and annoying, and sometimes, they don't.